Attach the nozzle and fill. Hang the nozzle back up. Your car fills in about five minutes—easy, clean and safe. You're back on the road and ready for hundreds of miles before the next refueling stop. Hydrogen is dispensed as a compressed gas. Most passenger vehicles use H70—compressed to 70 mPa—and larger vehicles use H35 (35 mPa). The station is a closed-loop system that meets national and international codes and standards. Nothing drips, spills or stinks when you fill the tank with lighter-than-air hydrogen. Safety systems at the station and on the vehicle are designed for a buoyant, gaseous fuel. A hydrogen station has several different safety systems that work together. If flame dectectors or gas sensors detect a fire or leak, then safety measures turn on automatically. The measures will seal the storage tanks, stop hydrogen flow or—in the case of an extreme fire—safely vent the hydrogen. Strategically placed emergency stops will manually shut down hydrogen equipment. Station developers work within the fire code and with their local authorities to maximize station safety. Hydrogen is all around us, but bound to other molecules—CH4, H2O, C2OH6. Producing hydrogen means separating from other molecules—something that's done all day, every day for the last 90 years. Because H2 comes from so many sources, every region of the world can produce its own fuel, which leads to better energy security for everyone. Most hydrogen is made by steam reforming natural gas. Its an efficient and cost-effective process process where CH4 reacts with high-temperature steam (H2O) in the presence of a catalyst to separate the hydrogen from other molecules. Some hydrogen is made by electrolysis; passing a current of renewable electricity (sun, wind, geothermal) through water. The H2 is stored and O2 released into the air. 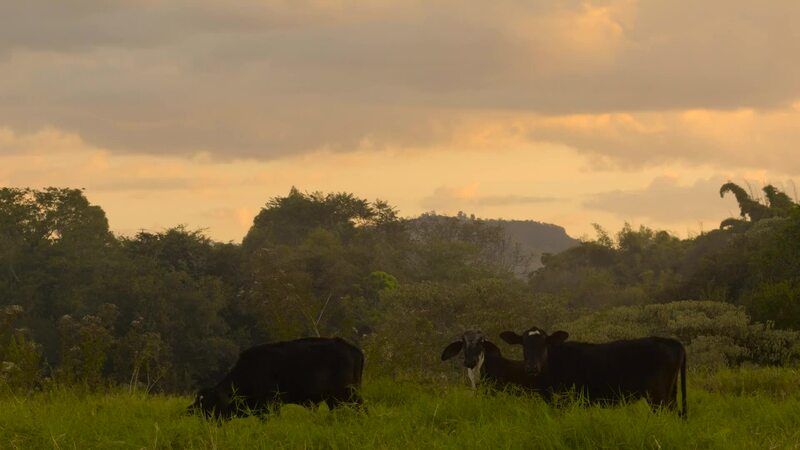 A new frontier is in using methane from plant and animal waste. Using steam reforming or gasification, what was garbage can become fuel. Other U.S. states and other countries are deploying FCEVs and hydrogen, too. In the U.S. H2USA leads planning and outreach to other states. 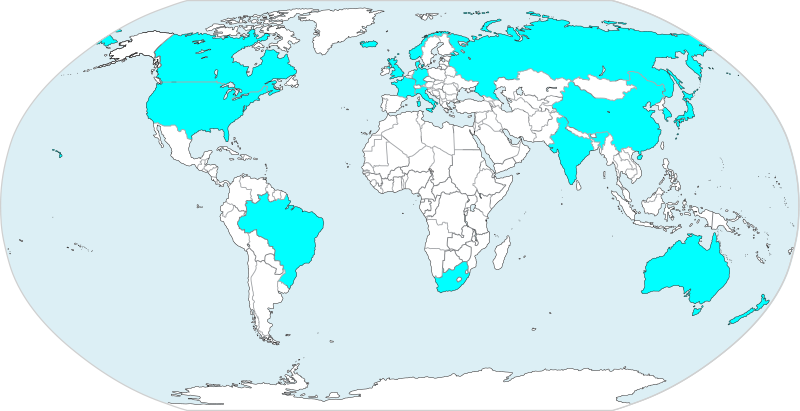 Germany, Japan and Korea have extensive FCEV programs. Other countries, including the UK, Denmark, Norway, China and Australia, all have growing hydrogen programs. California remains at the forefront of FCEV deployment and progress made here speeds deployment around the globe. Funding for hydrogen stations and other alternative fuels in California is via the Energy Commission's Alternative and Renewable Fuel and Vehicle Technology Program. The AB 8 statute authorizes the California Energy Commission to develop and deploy alternative and renewable fuels and advanced transportation technologies to help meet the state's goals for reducing greenhouse gas emissions and petroleum dependence in the transportation sector. Hydrogen is safely transported through 700 miles of US pipelines and 70 million gallons of liquid hydrogen is transported annually by truck over US highways without major incident. NREL's HyDRA map displays sites of current and potential hydrogen production from renewables and natural gas. Hydrogen is the smallest element, with one proton and one electron. It has an average atomic weight of 1.0079 amu, making it the lightest element, and a density of 0.08988 g/L, making it less dense than air. 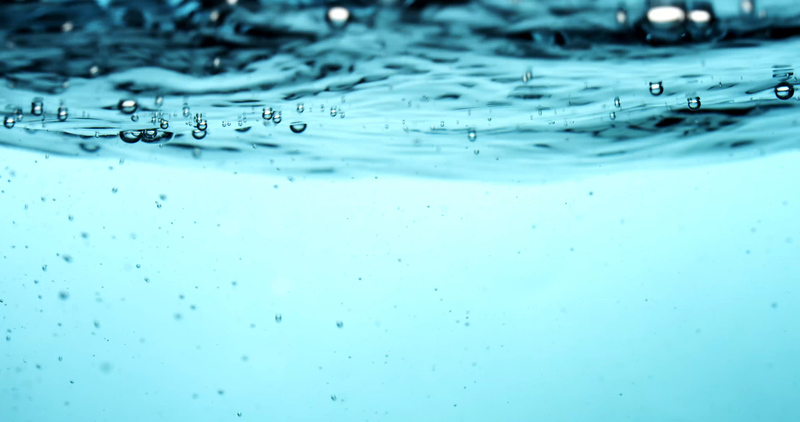 Because of these properties, hydrogen is lighter than air and is impossible to pool or puddle in one place. At standard temperature and pressure, hydrogen is a nontoxic, nonmetallic, odorless, tasteless, and colorless. It will won't pool or puddle, pollute groundwater, ruin beaches or harm wildlife. It won't drip on your shoes, make your hands smell or make the asphalt slippery. The price of hydrogen ranges from $12.85 to $16.78 per kg. As more stations become open retail and there is a higher utilization of the stations, the price per kg of hydrogen is projected to drop to ranges competitive with the prices of gasoline. Assuming that the average price per gallon of gasoline in California is $3.50 per gallon, hydrogen prices would have to drop to below $8.75 per kg to be competitive with gasoline. FCEV drivers are offered free fuel for the first three years of vehicle ownership or leasing, which is often paid for by the auto manufacturers. Hydrogen is the most abundant chemical substance in the universe, especially in stars and gas giant planets. On Earth, hydrogen is a diatomic molecule (consists of two atoms) and it has a propensity to form covalent bonds with most elements. In other words, it hates to be by itself and will quickly bond with another molecule. Hydrogen production is a chemical reaction; using heat and catalysts to release hydrogen molecules from natural gas or biogas, or using solar or wind energy to electrolyze water. 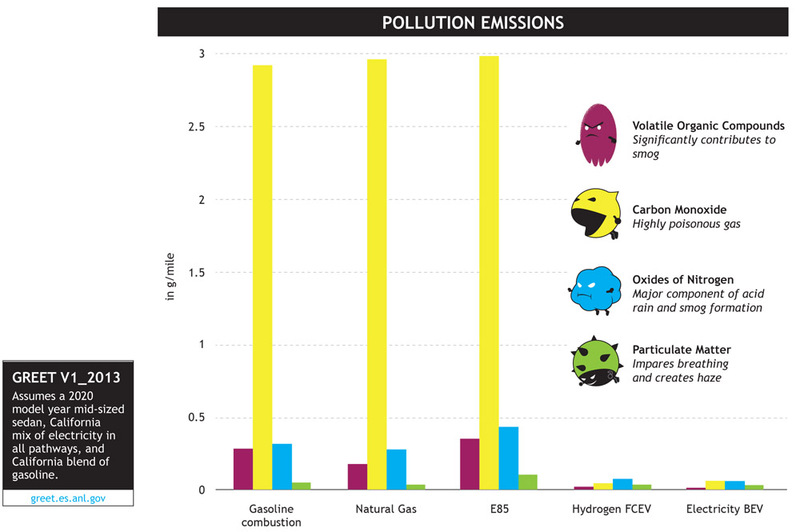 The California mix of hydrogen, which requires 33% renewables, also reduces greenhouse gas emissions. Read more on the Well to Wheels page. The wind blows and the sun shines even when power demand is low. Hydrogen is one way to store excess power. This short video from ITM Power briefly overviews a complex topic. Because hydrogen can be made from so many sources, every region can use its own local resources to make fuel—vital in the quest for energy security. The Energy Information Agency reported that hydrogen production capacity at U.S. oil refineries is more than 3 million cubic feet a day. Enough hydrogen is produced now to power 20-30 million cars. 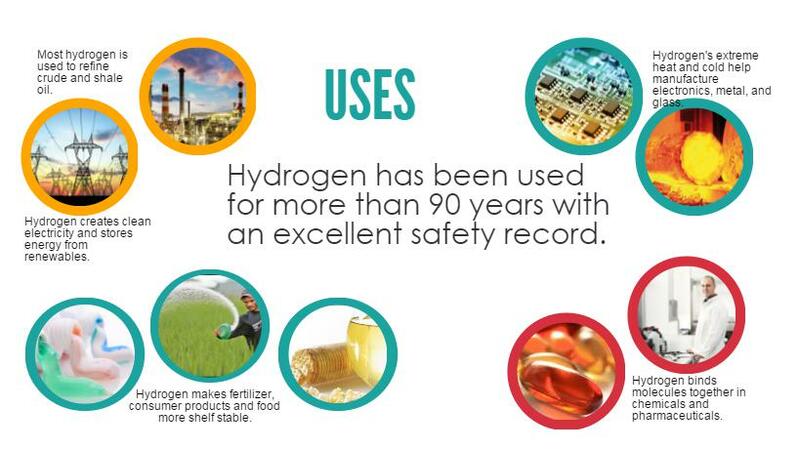 Hydrogen is part of the products that you use every day—from gasoline to toothpaste.